Verde Cocina nailed it. It was love at first bite with this place. It’s different. It’s not what you will get at every joint or food cart and I like that, I like that a lot. It’s nothing like what I had when we lived in Arizona and I have not had much like this in California. 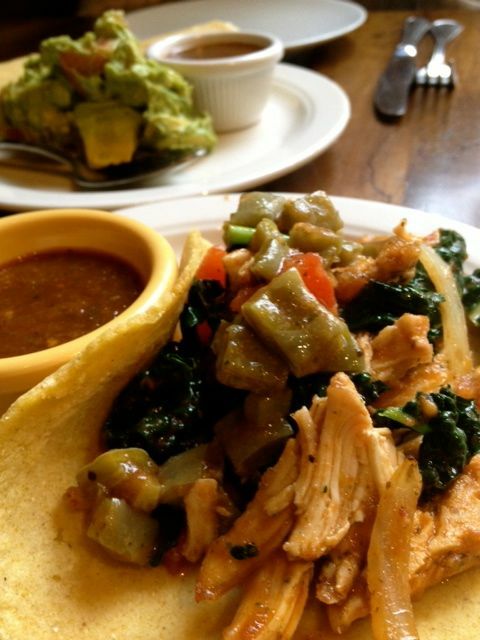 They are farm to table with a mexican flair. Beer and Mexican food. It’s a match made in heaven. 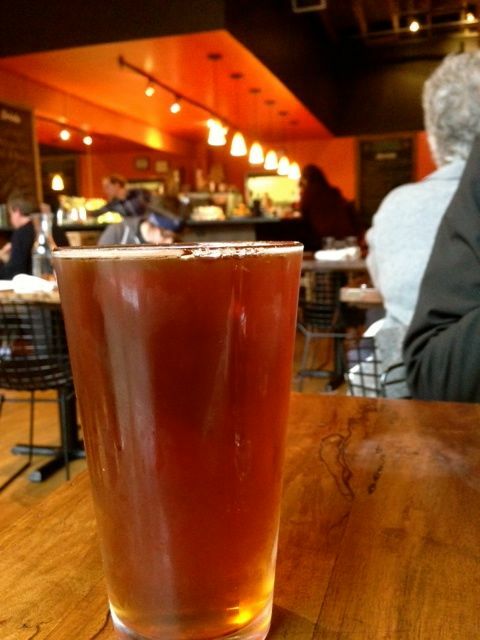 We snuck in just in time to get a few things off the Happy Hour menu. I have to say this was probably one of the best happy hour menus I have seen in a long time. It wasn’t just nuts and uninteresting things, instead it was guacamole, tacos, Ceviche and roasted veggies. It’s not a huge menu, it’s just an interesting menu that would actually fill me up. The $3 taco is a large taco considering it comes on a corn tortilla. The quacamole was a rather large serving. I noticed as we left someone else had ordered it off the regualar menu and it was definitely bigger, but the happy hour serving was plenty big. We did not get the Ceviche, but the people next to us did and I regretted that decision. They Oooh and Aaaahed over it. Happy Hour taco, served with amazing salsa, quac in the background. Not only was there a rather large menu to choose from, but they had nearly 7-8 specials that evening. 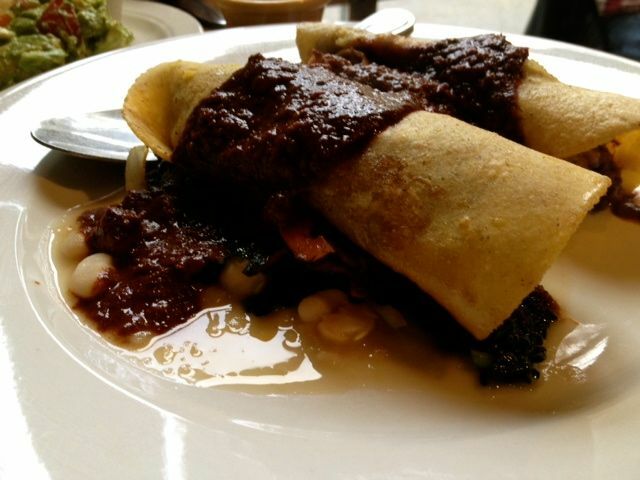 It was hard to decide, but we went with the Gringas con Mole. Soft rolled corn tortillas with a garbanzo-white bean mash, filled with either pork or veggies. We chose the pork because the dish comes atop beans and veggies. The pork was very, very good and I had no regrets, but the veggies were so spectacular I could have had veggies on the inside too. Even though this was filled with pork, I could have easily had just vegetarian and been completely happy. Great veggies!!! They also have a butternut squash enchilada that was a special, that she said was so good it should be on the regular menu. I don’t know how often it’s on the special list, but I need to try that. I knew since we were sharing everything that there was no way I could get him to agree to that. Next time!! I should also note that the whole menu is gluten free. I will be back for their brunch as well. I’m not a huge Mexican food breakfast, kind of person, but I’m willing to give these guys a shot!! As far as Happy Hour and Dinner these guys definitely make my favorites list. Atmosphere was very light bright and open. It has a garage door that opens up in the summer. Service was great. The gal that helped us was super helpful and sweet. Pricing was really good, and since we had a few items off the happy hour menu it made our meal quite affordable. The only bummer is forgot to use my Chinook Book coupon. Next time I guess. They have a fair amount of beers on tap. We shared a Caldera IPA. They also have a tequilla menu. Yep, that many to choose from. 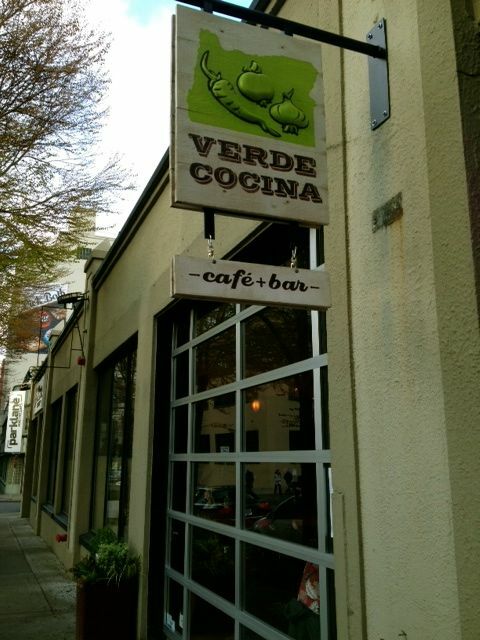 Verde Cocina is located in the Pearl, although they also have a Hillsdale location and some Farmers Markets.